However you've been making your scrambled eggs—whether you add milk, cream, or water—throw that method out the window and try this amazing buttery version instead! Adding rich and decadent butter turns regular scrambled eggs into a delicious dish that is creamy, soft, and velvety smooth with a rich, satisfying taste. After scrambling the eggs in a bowl, add small cubes of cold butter. 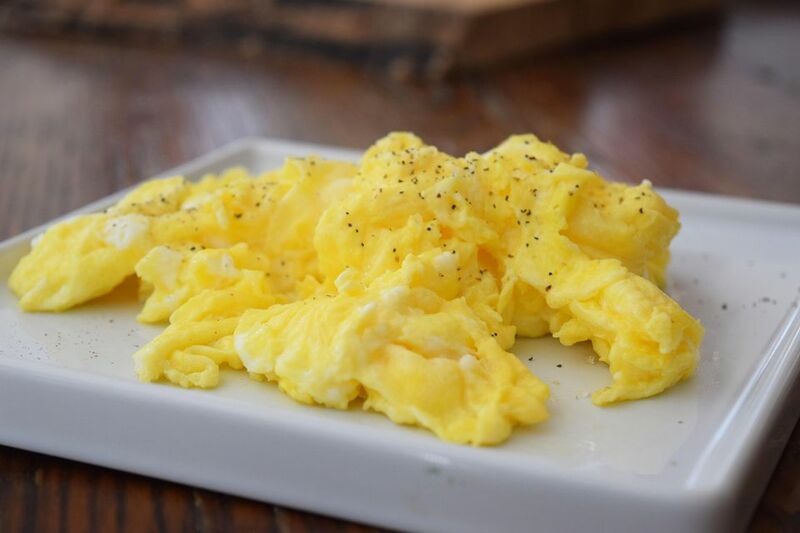 Then make sure to cook the eggs low and slow so they do not dry out and remain the perfect buttery texture. You can add these scrambled eggs to breakfast burritos or simply serve alongside bacon and toast. In a bowl, beat the eggs with a fork or whisk until thoroughly mixed and the yolks and whites are totally combined. Chop the 2 tablespoons cold butter into small cubes and mix into the eggs. Don't over mix; the butter should not melt into the eggs just yet. Once the butter is melted and foaming, add the egg mixture and cook for up to 1 minute without touching the eggs at all, until a thin layer, similar to an omelet, forms on the top. Before it sets up too much, gently stir the eggs with a wooden spoon, making sure to pull the eggs away from the edge of the pan. Continue cooking until cooked through and your desired texture is reached. This can take less than 2 minutes. It is important to remember that eggs will continue to cook and firm up after they are off the heat, so you want to turn off the burner a bit before the scrambled eggs are to your liking. Also, have the plates ready for serving so the eggs are perfectly cooked when ready to eat. If you find a wooden spoon isn't really doing the job, try a heat-safe rubber spatula. This tool is ideal for not only scraping the eggs off of the sides and bottom of the pan but also gently moving them around. This recipe is for simple, buttery scrambled eggs; however, there are many additions you can make, such as cheese, salsa, spinach, tomatoes, and any other veggies you prefer. The egg and butter mixture also works as a great base for an omelet. You can easily double, triple, or quadruple this recipe to serve to a crowd.